If you dig far enough back in Earwigoagin, you'll suss out the blogmeister's history as an International Canoe sailor. (Though, truth be told, I had more-or-less completely stepped out of the class a long time ago, seventeen years ago, way back in 2000, long before this blog.) 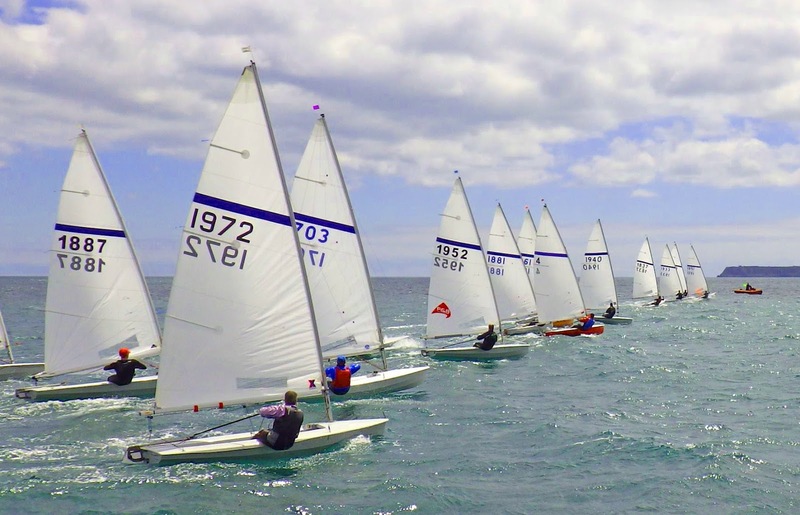 The International Canoe's are really great performance single-handed dinghies, and they are proving to be a good fit for top-notch (and I mean top-notch) oldster dinghy-ites who have kept up their fitness and boat building skills (ref. Chris Maas, Robin Wood, Steve Clark, Alistair Warren, Colin Brown and others (many of these skippers I competed against in the 1980's) - though you do need a bit of extra dosh to play at the top level; carbon this, carbon that, jibing daggerboard, T-foil rudder, mylar this, super control that... it all adds up). "The elders are thinking nice thoughts about a little more stability. Remember that the old development rule allowed boats as skinny as the new rules (750mm) and the boat that emerged as "best compromise" was 1014 mm wide. So I had been meditating about what I can do in a beamier hull form. It will probably give something away upwind and in a short chop, but there isn't much slower than a capsized IC. I have an idea, based on Lou Whitman's Phoenix that was probably faster than the Nethercot in 1970, but never got much of a chance after the ICF made the Nethercot the only approved shape." Being humble as I am (Oh, what the heck, push your brilliance out there) -- I was echoing Steve's most recent thoughts for a oldster International Canoe over ten years ago! Two years later, 2007, I pulled in my elongated, mod-Phoenix design IC into the normal International Canoe length - 17' (5.182 meters) and did a new design, the IC-Fatso. Maybe if you wait long enough, you find yourself sitting on the right part of the circle as it comes around again ... and then maybe not. Dinghy designs are always food for thought and more often than not, there is nothing new under the sun. The IC-Fatso remains a design exercise. I've never checked to see if the IC-Fatso would fit the current IC rule (it would be an OK design to the older one). 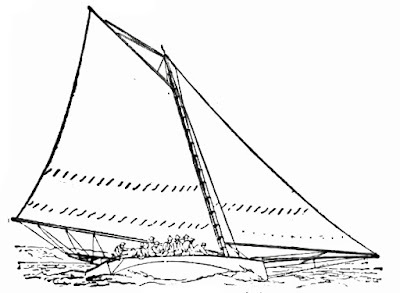 The IC-Fatso would, under most conditions, be slower than the current narrow IC's and the IC-Fatso wouldn't qualify as a Classic (the Nethercott, Slurp are the two designs in that fleet). It would be a safe design that would get you around mid-fleet with less trauma than the current designs and possibly faster than the Classics but it seems to fit in a tweener world - which makes it a difficult proposition to build for the class. 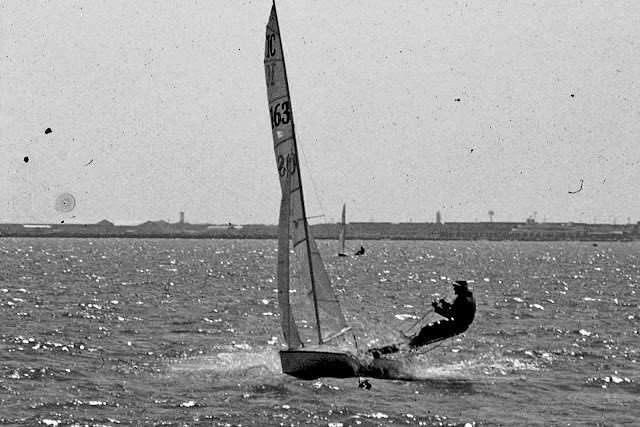 The blogmeister sailing his Nethercott "No Eyes" at the International Canoe Nationals at Lewes, Delaware in the early 1980's. We made it a family vacation that year and, in 2017, some 30 odd years later, returned a second time for a family beach week (no sailing). 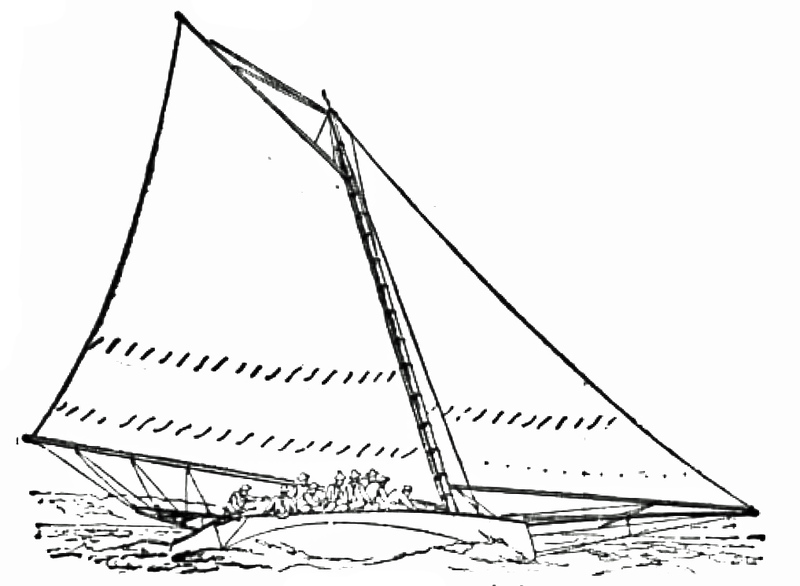 Bertrand Warion, French boat builder of classic dinghies such as Moth's, 9m2 Sharpie, and the Dinghy Herbulot, is also an accomplished marine watercolorist. Bertrand's watercolors are now offered up for sale on the Internet. Well worth a look if there is a area on your wall just begging for some boat art. Update 09/02: This link allows you to preview 63 of Bertrand's watercolors. Brian Carroll, son of Jack Carroll, designer of the Australian Sailfish, has finished up building an Australian Sailfish over the Australian winter. Greg Barwick sends along this photographic documentation of the Brian's boat build. Greg reckons this is the first new build in thirty years. There seems to be a great uptick in interest as the class website has recorded forty downloads of the Sailfish plans over the last nine months. To put the document into another tab (for viewing or printing), click the pop-out icon in the top right hand corner. More Australian Sailfish posts from the Earwigoagin archive - including some of the American Sailfish as well. 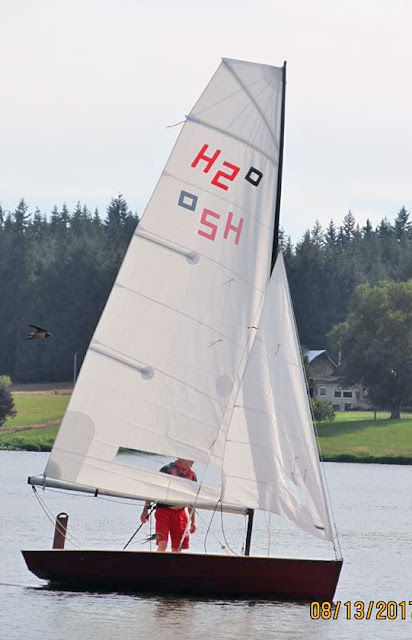 Mike Scott scrapped his techie Hoot cat-rig on his Hadron and has now installed a square topped 420 sloop rig (in Dacron). He intends to test this new rig on the mod-Hadron against a down-rigged (also 420 sail plan) International 14 which he also owns. He promises an update when he gets the two dinghies out together. I just got off the phone with my friend Tom Price, who is one of the organizers of the Sandbagger and Historical Aussie 18 Annapolis Week sponsored by the National Sailing Hall of Fame. He gave me a tentative schedule which I will update when I get more information. Sept 13 - Race 1 Sandbaggers/Aussie 18's, 1 pm. Type and format of the racing is up in the air, but given the size of the boats the course will be of some length. Ian Smith, historian of the Historical Aussie 18's, is scheduled to give a talk at some point. The focal point will be Annapolis City Dock and the NSHOF cottage. Historical sketch of a Sandbagger. 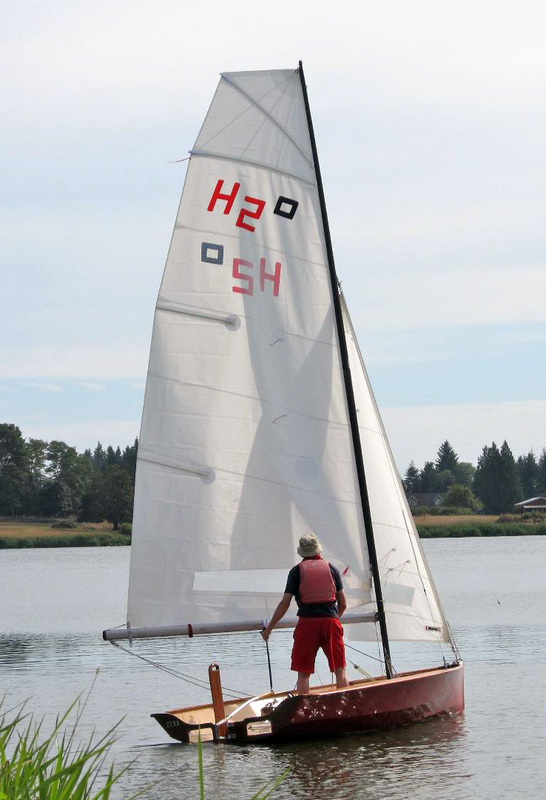 The previous header photo was of "Sally Streaker", a pink Streaker dinghy at speed. I've never been a fan of the masses of all white fiberglass dinghies being churned out - I appreciate color, any color. I could see myself in a Streaker dinghy if I lived in the UK. At 3.88 meters and 48 kg, the Streaker singlehander seems to have the right size, power and performance for an older codger like me. Here's a photo of one of their starts during the Nationals. There is a lot of verbiage and photos already on this blog. Almost from Day 1 there has been a debate in my head about the right time to plant the flag, declare it over and move on. However, the time isn't at this moment. May I direct you to this post from seven years ago which sums up the conundrum of a blogger.